DISTRIKT of San Francisco :: BM18 Fundraiser Launch! We’ve got another MASSIVE NEW STAGE in store for y’all (only thing constant is change right? We promise you’ll like it! ), good ol’ Funktion-one sound system and 6 days of open bar full of slushy goodness. Join us! Support DISTRIKT Non-Profit Corporation. 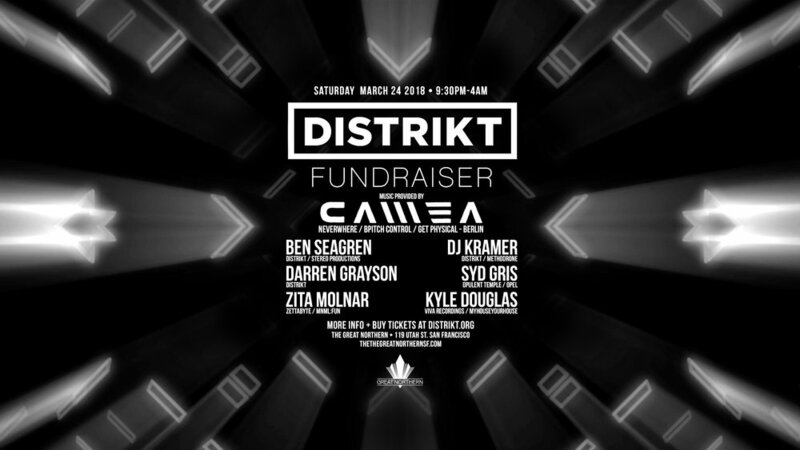 The best fundraisers are the ones that bring our community together, we all party and work together to raise money for DISTRIKT events! Her sound can be described as Seattle cool meets Brooklyn edge meets Berlin chic, and it has secured her a regular tour schedule worldwide. Camea was born and raised in Seattle as a classical and jazz pianist and has been collecting records and experimenting with electronic music since the late 90s. In 2002 she relocated to Brooklyn, NY, where the city's intense artistic environment deeply inspired her. Her passion for collecting and playing music continued to evolve as she acquired several regular club nights in Manhattan and spawned Clink Recordings, and on Friday evenings she had a radio show with Ambivalent (M_nus, Ovum) on East Village Radio. Eventually Camea began to tour internationally and moved to Berlin in 2007, where she still resides today and is currently signed to Bpitch Control, one of the world's premier underground labels that can be credited in the evolution of artists like Ellen Allien, Paul Kalkbrenner, Apparat and Modeselektor. Camea is a passionate performer and blends her more traditional musician roots with classic and modern house and techno. Her tracks have topped sales and DJ charts on many occasions, and she has been center stage at many of the world’s hottest clubs and festivals. Even though DJing has stayed the forefront of Camea's passion, when she is not touring she spends most of her time in her studio in Berlin. PERFORMANCES, CIRCUS ACTS & ART!